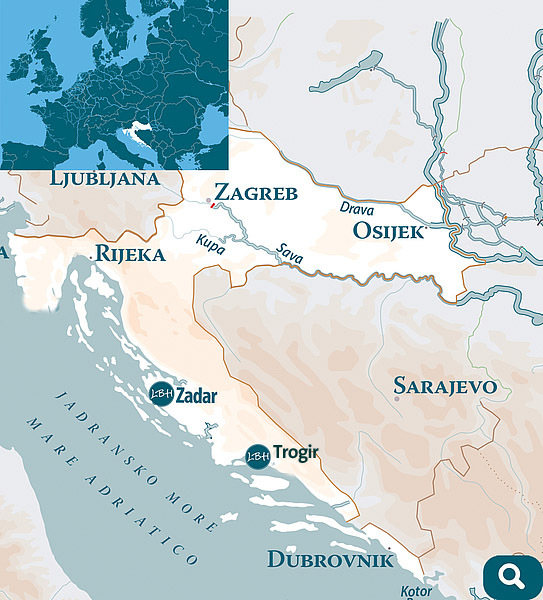 Explore Croatia from aboard your Linssen yacht! Reaching deep into the crytal-clear waters. The Adriatic is a secret Garden of Eden which opens the way to the warm and sunny Mediterranean. Take your Linssen motor yacht along the many islands and make your dream holiday come true. Don‘t hesitate to enter and make your dream holiday come true. This multicultural and hospitable country happily combines many diverse features in a small space. Olives, indigenous aromatic plants, white stone contrasting with the verdant vegetation and the mountain massif of Biokovo, whose spurs reach all the way to the sea. This area is truly an exceptional part of the country. Its beauty is made all the more enchanting by the numerous stories and cultural events which ensure that this region is always an interesting and attractive destination. Plan your trips to the islands: the Kornati Archipelago well-known as the centre of natural inspiration and peace. Explore the sunny islands of Hvar and Bra· for gourmet experiences or nightlife, or visit UNESCO world heritage centre Dubrovnik, it’s up to you. Attractions of all kinds can be reached on your yacht. Whether you want a relaxed holiday or an exciting one with lots of entertainment, nautical sports and marinas, Dalmatia is the right destination for you and your family.